April | 2017 | BES Drongos | Follow that monkey! Hello friends, it’s April Fools’ Day! You know what that means: tricks and jokes galore! But if you are here on this blog, reading this post, then you may have been on the internet researching about cool pranks to pull on your friends (of course). Since you’re already here, how about a quick post to brighten your day? On this day of fun and games, let’s take a look at the amazing tricksters of the animal world, who may trick their way around to stay alive, or just to have a good time. First in line is a relative of our namesake, the drongo. 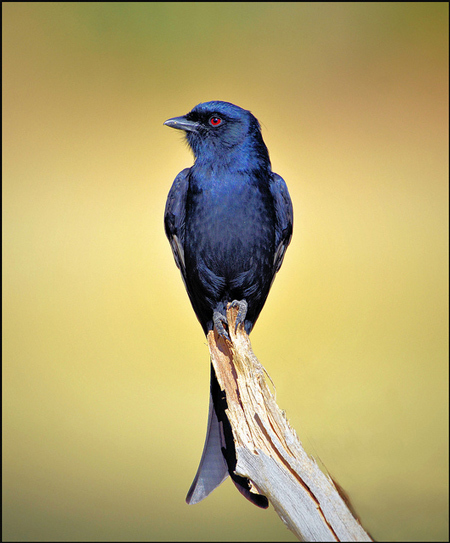 Specifically the Fork-tailed Drongo, hailed as the Kalahari desert’s greatest trickster. Almost 23 percent of their daily intake is stolen food, but for the animals that they steal from, the drongo is essentially a friendly watchbird, until he pulls a quick prank on them. When a predator is near, the drongo calls out in alarm to warn its friends, such as the meerkats, sending them scurrying away for cover. That’s pretty helpful, except the drongo swoops down and steals the food the meerkats left in their quest for a hiding spot. The drongo tries this a few times, although the meerkats learn and eventually the gig is up. But here’s something cool: as a final trick, the drongo mimics the meerkat’s own alarm call, and this time, the meerkats fall for it, scattering away as the drongo cackles internally and steals their food once again. But what are words when there are videos? There’s a cool clip that you may enjoy, complete with dramatic music and professional videography. Next, we have the Leaf Fish. Granted, it’s not as cute as the Fork-tailed Drongo, but there’s a reason. This freshwater fish looks and acts like a dead leaf, held up in a ‘floating’ position by its small, transparent fins. They’ll casually float close enough to their prey, and everyone’s having a good time until it strikes at the last moment, consuming smaller fishes with its projectile mouth. The attack lasts a quarter of a second, so blink and you’ll miss it. Then we have the Virginia opossum. The term ‘playing possum’ originates from this little guy, as when its frightened, the animal involuntarily drops ‘dead’, during which it stiffens with its mouth open and drooling and releases a stench of decay. The opossum’s drool also causes predators to steer clear of them, as drooling usually indicates sickness. It’s not a very graceful defence, although playing dead never is. What’s that? You want a video? Sure, now’s as good a time as any to watch a live opossum being dead for three minutes. 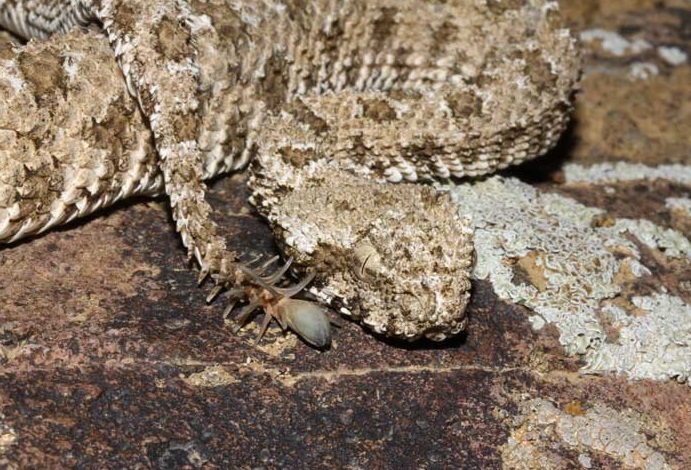 Next, we have the Spider-tailed Horned Viper, a species belonging to a genus of venomous vipers, who are so tricky it’s evil. As you can tell from its name, the end of its tail resembles a spider, which it uses as a lure for insectivorous birds. The resemblance is so similar that the bird may perch on the snake itself, landing it well within the snake’s striking range. This is an incredible evolutionary adaptation that’s honed a remarkable hunting technique. Here’s the first ever video taken of the viper in action. Watch it with caution, as the narrator’s voice may scare you a little more than the viper itself. 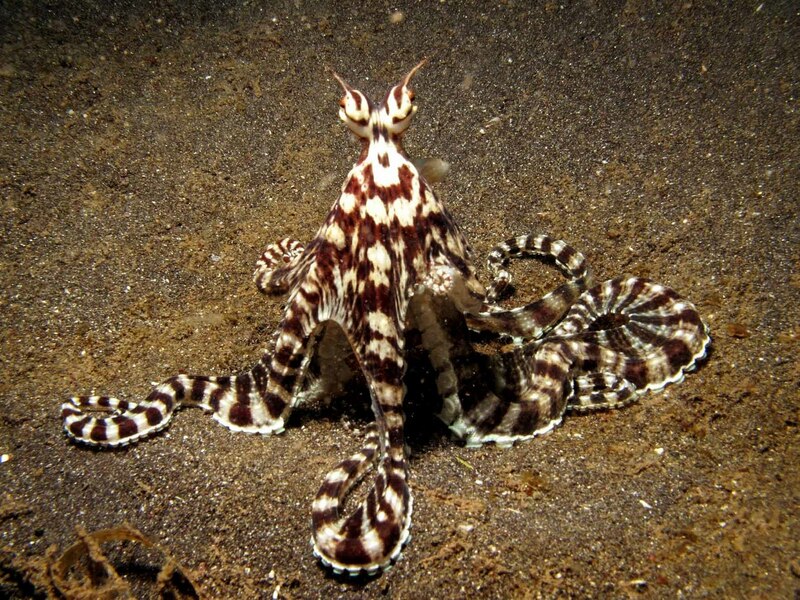 Last but not least, we definitely can’t leave out one of the most intelligent tricksters in the animal kingdom, the Mimic Octopus. This sea creature can easily mimic up to 15 different species (and counting), although only it’s mimicry of the lion fish, banded sole and sea snake are caught on video. It has been reported that it can also copy the stingray, jellyfish and starfish. We’ve reached the end of this post, but before I finish up, I’d like to encourage fellow readers to go ahead and learn about the other tricky animals that deserve equal attention. It’s all very entertaining content, I promise you. Have a happy April Fools’! Basham, Jessica. “Scared To Death: Opossums Play Possum”. Welcome to Walton Outdoors. N.p., 2010. Web. 31 Mar. 2017. Morell, Virginia. “African Bird Shouts False Alarms To Deceive And Steal, Study Shows”. News.nationalgeographic.com. N.p., 2014. Web. 31 Mar. 2017.